Current high-end x86 processors are hot, hot beasties. AMD and Intel's best chips are manufactured on a 45nm process and need up to 125W and 130W, respectively, of cooling power to keep them chugging along within tolerances. The ever-increasing TDPs have lead to both companies bundling in larger, more efficient air coolers with retail chips, to the extent that they can be considered enthusiast-class. A well-designed PIB cooler is good enough to keep the chip(s) running at their native speeds, obviously, but the enthusiast who wants to extract more 'free' performance from their system may well indulge in some robust overclocking, usually by adding voltage as the frequency tops out. That's why there's a whole raft of aftermarket air coolers for Intel's LGA775/1,366 and AMD's AM2+/AM3 CPUs, ranging from anywhere between £10 to £60. Air cooling has the inevitable drawback of being limited by the ambient temperature, no matter how efficient the transfer from chip to fan. The next step up is to use a liquid-cooled setup that is better at absorbing and dissipating the heat produced by the CPU. This is where budget all-in-one, easy-fit systems come in, costing around £50 and purporting to have better cooling credentials. 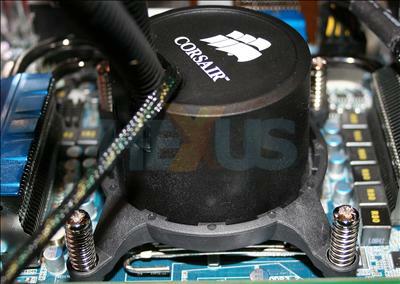 Corsair recently teamed up with Asetek and launched such a cooler last month. Dubbed the Hydro Series H50 and currently etailing at £59, the memory specialist is aiming to destroy the high-end air-cooling market. Is it better than a Thermalright Ultra-120 eXtreme when tasked to cool a near-4.0GHz-clocked Core i7 chip. Read on to find out.